Mustache Mayhem is a mixed media and electronics project that challenges the paradigms of personal privacy and entertainment. 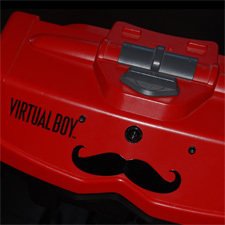 Based on the short-lived Nintendo Virtual Boy video game console and retro-fitted with a BeagleBone Black Linux computer, this artistic hardware hack provides a singular, entertaining goal: Overlay virtual mustaches onto real-world faces for points. The project incorporates many open source software packages, such as OpenCV for face detection and image manipulation, SDL for audio playback, Cairo and Freetype for font rendering, and libsoc for low-level I/O interfacing. 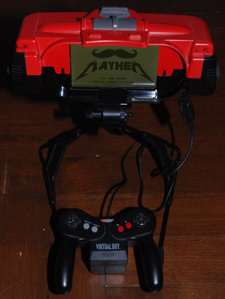 The original Virtual Boy controller is used for gameplay and to provide power to the system. This piece is one-of-a-kind and not for sale.